A new, clean and appealing white cover design with gold stamping refreshes a family keepsake. 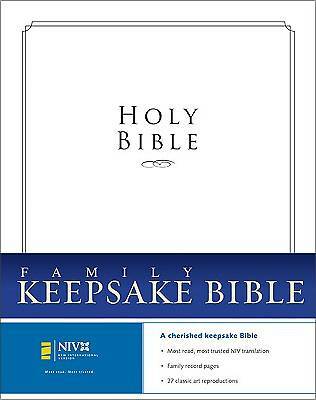 An affordable, attractive family Bible sure to become a cherished keepsake. Presentation page, plus family tree and record pages,including Births, Deaths, Marriages, Husband’s/Wife’s Family Tree, Church Record, and Special Family Events. Sixteen pages of full-color classic art reproductions.